In a short period of time, humans have manipulated the planet like no other species in recorded history. The gargantuan footprint of Humanity on Earth is unprecedented, and our technologies further the complexity of our influence on the future. Though we live in an age of great productivity and innovation, we are undoubtedly part of one of the most punctuated mass species extinction in geologic history – what Elizabeth Kolbert masterfully describes as “the Sixth Extinction”. I hope to present you with some of the lead-weight facts and findings from her beautifully written book. Her writing style made even the saddest subjects shine with dignity and grace. I cried, questioned out loud, and stood up out of my seat while reading this book; it certainly moved me in every sense of the word. I tried to summarize the highlights that spoke strongest to me, and I am skipping over a lot! This book is rich with statistics, figures, and information that all support her thesis. I highly recommend reading her book in full, and then try to think of new ways you can help, too. We need all hands on deck. 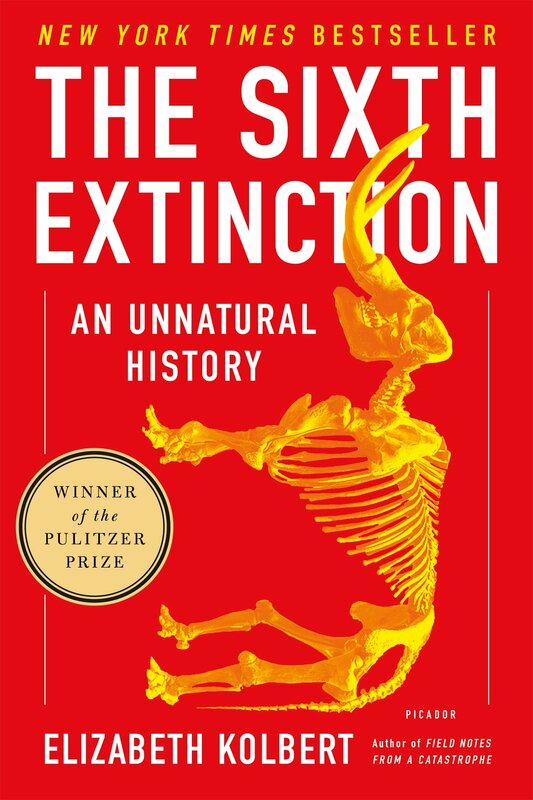 To gain a context for this book, it’s important to first review the “Big 5” mass extinction events in Earth history. The first was the late Ordovician, about 450 million years ago (mya), likely due to changes in sea level and glaciation. Then there was the late Devonian, about 365 mya, where some 75% of species were lost from possible volcanic ash, and eutrophication from algal blooms in the ocean. The third was the Permian-Triassic, about 250 mya, when 96% of life perished as a result of massive volcanic eruptions that altered the atmosphere and acidified the oceans. The fourth was the Triassic-Jurassic extinction, beginning some 200 mya, and lasting for several millions of years as a proposed combination of volcanic flood basalt eruptions and an asteroid impact were to blame. The fifth happened in the Cretaceous-Paleogene, about 65 mya, from an asteroid and volcanic eruptions, wiping out dinosaurs and ¾ of species on the planet. Bottom line? The Big 5 Extinctions happened over a long period of time, and were brought on by natural phenomena, not the direct consequence of one species’ actions. Over 100 species have gone extinct since 1980, the year I was born, and dozens are threatened. Of all threatened species, amphibians top the list. Author Elizabeth Kolbert is quick to explain the title of her book The Sixth Extinction. She references a pair of early authors to first publish an essay using the term “sixth extinction”. Authors David Wake, of UC Berkeley, and Vance Vredenburg, of San Francisco State University published an article in the journal Proceedings of the National Academy of Sciences titled “Are We in the Midst of the Sixth Mass Extinction? A View from the World of Amphibians”. David Wake studied the decline of frogs in the Sierra Nevada mountains of California, where in his lifetime he had known them to be populous. Suddenly there were die-offs everywhere, and scientists have continued to document overall amphibian species loss regularly. They are known as an “indicator species”, for their sensitivity to subtle, and not so subtle, changes in environmental conditions; their reactions to toxins often indicates how other larger species, like we humans, may be impacted. What’s killing the frogs? It’s Bd fungus, short for Batrachochytrium dendrobatidis, and it has ravaged frog populations beyond the Sierra Nevadas. Its relative Chytrid fungus is decimating Panamanian golden frogs, among many other species, in Central America. “Everyone I spoke to at EVACC told mt that the center’s goal was to maintain the animals until they could be released to repopulate the forests, and everyone also acknowledged that they couldn’t imagine how this would actually be done” (Kolbert, p. 14). Volunteers toil tirelessly for a mission that seems more impossible with each dying frog. I am in awe of their determination, steadfast morale, and daily efforts to make some headway on this daunting fungus. These funguses can be thought of as invasive species, as they have spread their way across the world to populations maladapted to their wrath. For some perspective, a key concept called “background extinction rate” is introduced in this first chapter. “It is the rate of which a species goes extinct in ordinary geologic times: no volcanic eruptions, asteroids, or dramatic, punctuated event. Depending upon a complex set of factors that vary from species to species, mammals may have an extinction rate of about ¼ per million species-years…since there are about fifty-five hundred mammal species wandering around today…you’d expect – once again, very roughly – one species to disappear every seven hundred years” (Kolbert, p. 15). Amphibians’ extinction rate has yet to be determined, as their fossils are so rare, and are required for determining its rate; however, approximately one amphibian species in the world may go extinct every thousand years or so. Amphibians are the “most endangered class of animals, though; it’s been calculated that the group’s extinction rate could be as much as forty-five thousand times higher than the background rate. But extinction rates among many other groups are approaching amphibian levels. It is estimated that one-third of all reef-building corals, a third of all fresh-water mollusks, a third of sharks and rays, a quarter of all mammals, a fifth of all reptiles, and a sixth of all birds are headed toward oblivion” (Kolbert, p. 17). Let those statistics sink in for a second. Now visualize them in your mind. That’s one out of every three corals at risk for extinction. Now consider this: one out of every four ocean species depends upon coral reefs for their survival. The ramifications are nothing short of catastrophic for life as we know it. With fisheries already overtaxed, it’s no joke that we may not have fish to eat in our lifetimes. That’s a big problem not just for the billions of people who depend upon fish for their main protein source, but for the multitude of species that make up a complex, delicately balanced ecosystem that is completely dependent upon biodiversity. It’s outright depressing, simply for the sake of so many species at risk for extinction. I care about us, but I’m mostly sad for the animals. One of the biggest threats to healthy, diverse populations of organisms worldwide comes from invasive species. Kolbert explains some likely avenues for Bd’s introduction to the Americas: the “Out of Africa” hypothesis, in which shipments of African clawed frogs used for pregnancy detection in the 1950’s were spread worldwide; or the “frog-leg soup” hypothesis, in which the introduction of North American bullfrogs to other countries is to blame. “Either way, the etiology is the same. Without being loaded by someone onto a boat or plane, it would have been impossible for a frog carrying Bd to get from Africa to Australia or from North America to Europe. This sort of intercontinental reshuffling, which nowadays we find totally unremarkable, is probably unprecedented in three-and-a-half-billion-year history of life (Kolbert, p. 18). Species are being exposed to foreign pathogens that they can’t evolve quickly enough to build immunity against. Invasive species outcompete and edge out native species that play vital roles to long-established cycles within the ecosystem. It is a balancing act that is held in harmony by its diversity, and a growing laundry list of invasive species stand against it. Kolbert explains in great detail the history of extinction, speciation, and evolution in chapters two and three, including how Darwin not only discovered new species, but in his lifetime saw the extinction of an iconic European species: the great auk. Great auks were large, flightless birds about two and a half feet tall, with small wings adapted for swimming in the ocean. They were eaten into extinction by Icelanders, on the island that served as the last death knell of the auks. Once widespread throughout the world, their numbers quickly plummeted as they became a primary food source for humans, in addition to serving as fish bait, feathers, and even fuel (Kolbert, p. 60). A preserved great auk serves as a totem of its tragic demise, with the inscription at its base: “The bird who is here for show was killed in 1821. It is one of the few great auks that still exist” (Kolbert, p. 57). The last pair of auks was killed off on the Icelandic island of Eldey in 1844 by a trio of men arriving by rowboat. “‘The bird that is shot is a parent. We take advantage of its most sacred instincts to waylay it, and in depriving the parent of life, we doom the helpless offspring to the most miserable of deaths, that by hunger. If this is not cruelty, what is?’ Newton argued for a ban on hunting during breeding season, and his lobbying resulted in one of the first laws aimed at what today would be called wildlife protection: the Act for the Preservation of Sea Birds” (Kolbert, p. 67). The Great Auk can, sadly, be added to the list of species plucked – quite literally in this case – to extinction. Newton’s environmental activism, on the other hand, set an admirable precedent. Human activity has transformed between one third and and one half of the land surface of the planet. He was also quick to note human’s alteration of Earth’s atmosphere from the burning of fossil fuels. Our current carbon dioxide levels hover around 400 ppm, which is higher than any point in the last 800,000 years, if not longer; if current warming trends continue, we’re predicted to top 500 ppm, or twice pre-Industrial levels, by 2050 (Kolbert, p. 113). The effects of such warming are numerous: changes in climate with more extreme weather events; sea-level rise from warming oceans, and melting ice-sheets; acidifying oceans, killing many species; changes in native ecosystems from invasive species; and those are just several. As Kolbert snorkels among beautiful coral reefs, she and others lament their visible decline, and more commonly, demise. With the pH of the ocean lowering as acidity rises with the absorption of carbon dioxide into the ocean, pteropods, corals, and other shelled creatures who depend upon a delicate chemical reaction of calcium carbonate are literally dissolving. In Castello Aragonese, a small island in the Tyrrhenian Sea, Kolbert dives with researchers studying ocean acidification; they have a natural source of carbon dioxide from an active volcanic vent beneath the sea. Check out a short video of it here. It provides for a perfect laboratory to study varying acidity; the areas closest to the vents have the highest carbon dioxide, and the highest acidity. As you move away from the vents, there are varying pH zones. Scientists study the organisms in each zone, how they’ve adapted to their unique environments, and experiment with species to see how they react to changes in preferred acidity. In the pH 7.8 zone, three-quarters of the missing species are calcifiers (Kolbert, p. 122). Today, we’re at about 8.1, but that number is expected to drop. Kolbert continues to The Great Barrier Reef to delve into the effects of ocean acidification on corals. I was curious to learn about what’s called the “saturation state with respect to calcium carbonate”; it’s basically how much is available in a given amount of seawater. “Prior to the Industrial Revolution, all of the world’s major reefs could be found in water with an aragonite saturation state between four and five. Today, there’s almost no place left on the planet where the saturation state is above four, and if current emissions continue, by 2060 there will be no regions left above 3.5…Eventually, saturation levels may drop so low that corals quit calcifying altogether, but long before that point they will be in trouble” (Kolbert, p. 137). “A few decades ago I, myself, would have thought it ridiculous to imagine that reefs might have a limited lifespan. Yet here I am today, humbled to have spent the most productive scientific years of my life around the rich wonders of the underwater world, and utterly convinced that they will not be there for our children’s children to enjoy”. A recent study by Australian researchers found that coral in the Great Barrier Reef has declined by fifty percent just in the last thirty years (Kolbert, p. 138). Furthermore, a study published in the journal Science in 2008 found more than a third of 800 reef-building coral species to be in danger of extinction (Kolbert, p. 142). This was one of many moments in the book that made me cry. It’s not simply because I may not be able to snorkel among the vivid reefs I’ve explored before; it’s the collapse of a long-established ecosystem, and its hundreds of dependent species that worry me. It’s happening in our lifetime, and faster than we think. Kolbert travels to the rainforests of Manu National Park in Peru, and the Amazon in Brazil to witness changes in biodiversity from deforestation. Then, she’s back to the US, where bats are fighting White Nose Syndrome, a deadly fungus that has made its way to the Americas, and is decimating bat populations. This is part of the species “reshuffling” that’s happened with invasive species being shipped, flown, driven, and sailed across the continents. And at this point in the book, it’s easy to see how their impact is all-encompassing. “To the extent that we can identify the causes of these revolutions, they’re highly varied: glaciation in the case of the end-Ordovician extinction, global warming and changes in ocean chemistry at the end of the Permian, an asteroid impact in the final seconds of the Cretaceous. The current extinction has its own novel cause: not an asteroid or a massive volcanic eruption but ‘one weedy species’. As Walter Alvarez put it to me, ‘We’re seeing right now that a mass extinction can be caused by human beings’. The one feature these disparate events have in common is change and, to be more specific, the rate of change. When the world changes faster than species can adapt, many fall out” (Kolbert, p. 266). “Right now, in the amazing moment that to us counts as the present, we are deciding, without quite meaning to, which evolutionary pathways will remain open and which will forever be closed. No other creature has ever managed this, and it will, unfortunately, be our most enduring legacy. The Sixth Extinction will continue to determine the course of life long after everything people have written and painted and built has been ground into dust and giant rats have – or have not – inherited the earth” (Kolbert, p. 269). I knew this would be a difficult book to read. Learning about a multitude of hopeless, tragic cases of animals dying isn’t for the light-hearted. I cried several times while reading this book, my heart heavy with the guilt and anger of what we’ve done to our animal companions. This book also reminded me that I’m not doing enough to help improve any of the problems I’m so upset about. Like most people I know, I fastidiously recycle, reduce, and reuse; I donate to a few charities that are fighting for the very causes I’m concerned about. I work hard to educate my Seventh grade Science students about the state of our planet, and hopefully that creates a ripple effect. But overall, I feel like I ought to be doing more. It is painful to just stand on the sidelines watching a tragedy unfold, and I feel like we all – as in all 7.6 billion of us – should be doing more to help. I realize not everyone may care about the state of our environment as much as people like Kolbert do, or like I’d like to think I do. We all have different calls to action. Some issues concern some more than others. Sometimes we get overwhelmed by the severity of them all. But it’s important to stay in the loop, know what’s happening, and be proactive with that information. There are many things we are doing to make progress on these issues, and we ought to try everything possible to ebb the destructive tide we’ve risen. I hope you read this book in full, and I hope it inspires you. It takes a world of smart, creative humans like ourselves to solve our way out of the crisis we’re in, and we all play a part in the solution.